How come most big ice cream chains or brands don't do a solid rocky road ice cream anymore? Do I really have to go to beer to satisfy my sweet tooth? Well, ok, you don't have to twist my arm on this one. 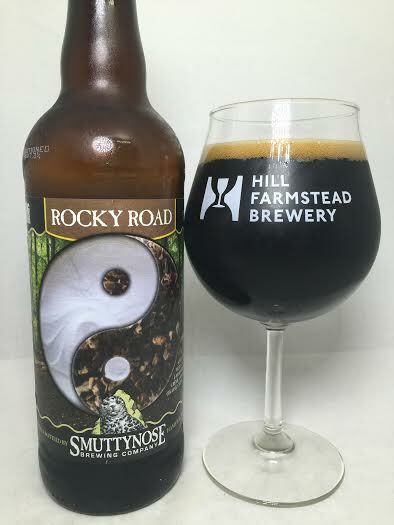 Brewed with cacao nibs, marshmallow creme, and then aged on oak chips, Smuttynose is pulling out all the stops to deliver a decadent dessert beer. Sits pitch black in the glass and there is no existence of brown or red on the edges. Truly a dark beer. The pour produced two fingers of light brown head. I must say that I am surprised at how dominant the oak chips are on the aroma. In addition, there is some bitter dark chocolate and black coffee. No marshmallow to be had. A pleasant, fluffy milk chocolate taste envelopes the tongue and creates a dessert-like atmosphere. I'm happy to report the marshmallow is here on taste. It may not be as bold as I had hoped, but it is still noticeable enough to leave its mark. A lot of dark coffee or coffee grounds are also taking over midway through the mouth and those oak chips are just as big as they were on the aroma. When the oak combines with the burnt coffee taste it creates almost a char-like flavor. I think maybe the aging on oak chips was supposed to add a nutty flavor, but I just get char and wood. Mouthfeel isn't as thick as a big imperial stout, but it isn't thin either. No alcohol at all and the only thing that really lingers is that coffee ground taste which stick to the back of the tongue. In terms of comparing this to rocky road ice cream, I would say that while the cacao nibs did exactly what they needed to do, the marshmallow and the nuttiness needed to step their game up. It is still a fine after dinner beer to have with dessert, but I think Sloth from The Goonies would not fully approve.